Obviously the best way to store a bunch of 5 gallon buckets is to stack them neatly into bucket skyscrapers, like I’ve done here. I often build stacks of 10 or more buckets at a time. Unfortunately when you stack more than a few buckets together, they combined weight of all those buckets compresses all the air out. This causes the vacuum that makes tugging them apart difficult. One solution is to drill holes in the bottom of every bucket but then your buckets are become less useful. Or you could just yank them apart every time using our unstick stuck buckets technique. We found the Bucket Spacer idea on Pinterest. 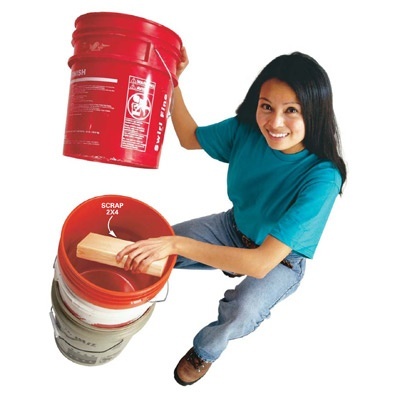 Slip a scrap piece of 2×4 between each bucket to prevent the vacuum in the first place with some scrap 2x4s. It’s and easy, cheap and elegant solution. That’s what I do – works great!